By Alistair Reign, July 15, 2016, Alistair Reign News Blog. Soldiers took control of TRT state television late Friday night. A statement read by an announcer said the military had taken control of the country and that a curfew and martial law had been imposed. Turkey’s airports have been shut down and all flights cancelled. Soldiers also blocked the two bridges over the Bosphorus in Istanbul and other parts of major cities, while access to social media in the country appeared to be shut down. 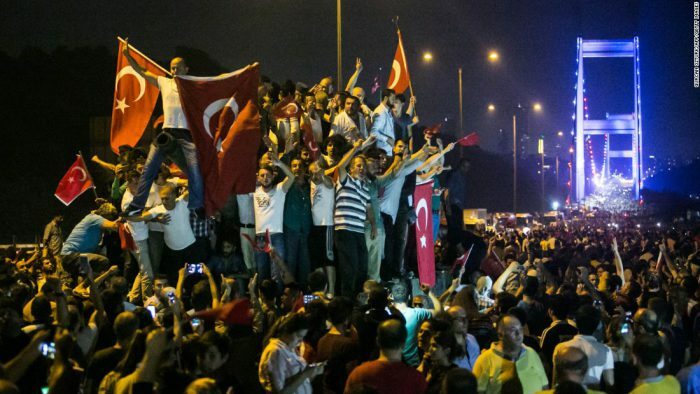 Turkish troops claimed to have seized control of the country in a coup attempt Friday night, amid reports of explosions and gunfire in Istanbul and Ankara. Turkey’s President Tayyip Erdogan called the actions by the military “an attempt at an uprising by a minority within our armed forces” and called on citizens to take to the streets in protests. Gunfire and explosions were reported in Istanbul and Ankara. Witnesses said tanks surrounding the parliament building had opened fire, while a Turkish military commander said fighter jets had shot down a helicopter used by the coup plotters in the capital. Turkish Prime Minister Binali Yildirim and other senior officials said the elected government remained in office, blaming the coup on loyalists of US-based cleric and opposition figure Fethullah Gulen. His movement denied involvement. International leaders, including those in the US and EU, voiced their support for Turkey’s government. Erdogan returned to the country early Saturday morning and was met by crowds of supporters as his plane touched down in Istanbul. We welcome comments and conversations. Scroll to bottom of page to use the comment box.